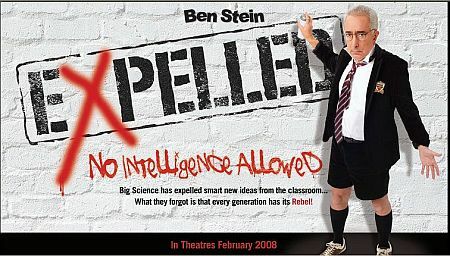 Expelled: No Intelligence Allowed is, at the very least, a thought-provoking movie that may either get your blood boiling or leave you shaking your head at the absurd idea of Ben Stein (yep, the teacher from the move Ferris Bueller’s Day Off who monotoned his way to celebrity with the famous line “Bueller? Bueller? Bueller? Bueller?”) investigating why the American scientific community is apparently black-balling any one – regardless of status or credentials – who dares to even entertain the idea of Intelligent Design in a serious way. Stein’s main goal may be less rooted in an effort to promote Intelligent Design as a sound scientific theory than it is an effort to prevent the suppression of scientific inquiry in modern America. After all, wasn’t America founded on the principals of freedom of speech, freedom of thought, freedom of religion, and a whole host of other freedoms we would dearly love to take for granted? 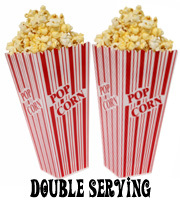 Sure to be controversial and already panned by the majority of reviewers, this movie deserves to be viewed by open-minded people who may be unaware of the current state of science education in the U.S. Stein has uncovered an “elitist scientific establishment that has traded in its skepticism for dogma… and that allows absolutely no dissent from Charles Darwin’s theory of random mutation and natural selection. What freedom-loving American wouldn’t be outraged?” We enjoyed it immensely; it was surprisingly entertaining, and refreshingly thoughtful. On the one hand, it does accomplish what its title infers. “Expelled” refers to several college profs and scientists who were reportedly denied tenure or lost their jobs because they dared to mention Intelligent Design (ID) in the classroom, in research papers, or on the job. The film presents these cases in varying degrees of detail, but always implying that a clear injustice was done in each situation. The film’s subtitle, “No Intelligence Allowed,” refers to what Stein and the filmmakers decry as a lack of “academic freedom” or “open inquiry” in academia and the scientific community. The movie argues that gatekeepers in those circles aren’t even allowing ID as a topic of discussion. Of course, filmmakers only depicted those situations which support their premise—the movie was made by a company called Premise Media—but ignore any cases of public school classrooms across America where ID theory is at least discussed, if not taught. So, the film succeeds in making the point that Intelligent Design should at least be on the table for discussion. But if you’re looking for ammunition to argue your Darwinist friends under the table, you may want to look elsewhere. While Expelled certainly leans heavily toward the ID side of the debate, it’s not trying to present an airtight case, or to shut the door on evolutionary theory. But there are plenty of interesting interviews along the way, with scholars and scientists coming from all perspectives on the issue. And even though the filmmakers are ID believers, they didn’t merely throw softball questions to the experts on their side. They—mainly Stein, a decent interviewer—challenged many of the ID proponents’ claims, pushing them to further explanation and clarification. And filmmakers can’t be accused of denying Darwin proponents equal opportunity—Dawkins, PZ Myers, Will Provine, and Eugenie Scott, among others, get plenty of screen time. While they certainly edited these interviews for their own purposes, it’s clear the filmmaker didn’t pull a cut-and-paste way-out-of-context fast one either—this is no Michael Moore hack job, slicing and splicing every which way so you have no clue what footage to trust, or not. The film’s biggest flaw is a too-long segment where Stein explores Darwinism’s alleged connection to Hitler, Nazism, and the Holocaust, essentially implying that such horrific events are almost a necessary result of belief in evolution. In an interview with CT Movies, Stein said he was especially taken by the book From Darwin to Hitler, saying that “It’s about how Darwin’s theory . . . led to the murder of millions of innocent people.” Well, maybe, or maybe not. That may be a theme to be more fully explored in another documentary, but for the purposes of this film, it seemed too tangential. But another result of wartime Germany did not seem tangential—recurrent images of the Berlin Wall as a metaphor for the supposed “wall” in academia and scientific circles, the wall that represents the two “sides” of the debate. The filmmakers—and Stein—would say that the wall is very real, that it was constructed by the “thought police” of the scientific community (read: evolutionists) who have no intent of allowing ID proponents any access to the other side. This entry was posted in Movies and tagged Ben Stein, Documentary, double serving, Expelled: No Intelligence Allowed, Intelligent Design by S.D. McPhail. Bookmark the permalink.